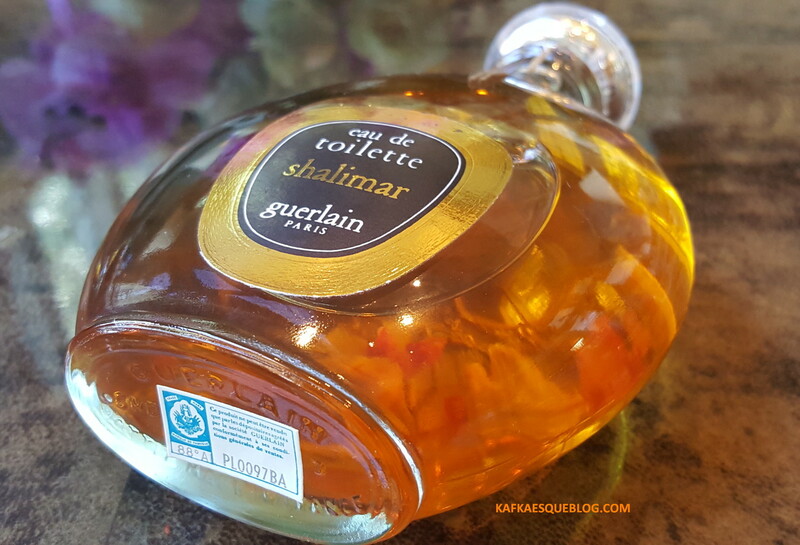 There are some fragrances so iconic, so beloved, and so immense in their impact that they require little explanation, and Shalimar may be at the very top of that list. Vintage Shalimar, however, requires a lot of explanation when it comes to choosing the right one for you, especially if you’re trying to stay within a budget. My hope is to make some of it less confusing for you and to give you a few pointers, but I also want to pay tribute to vintage Shalimar in its pure parfum form. 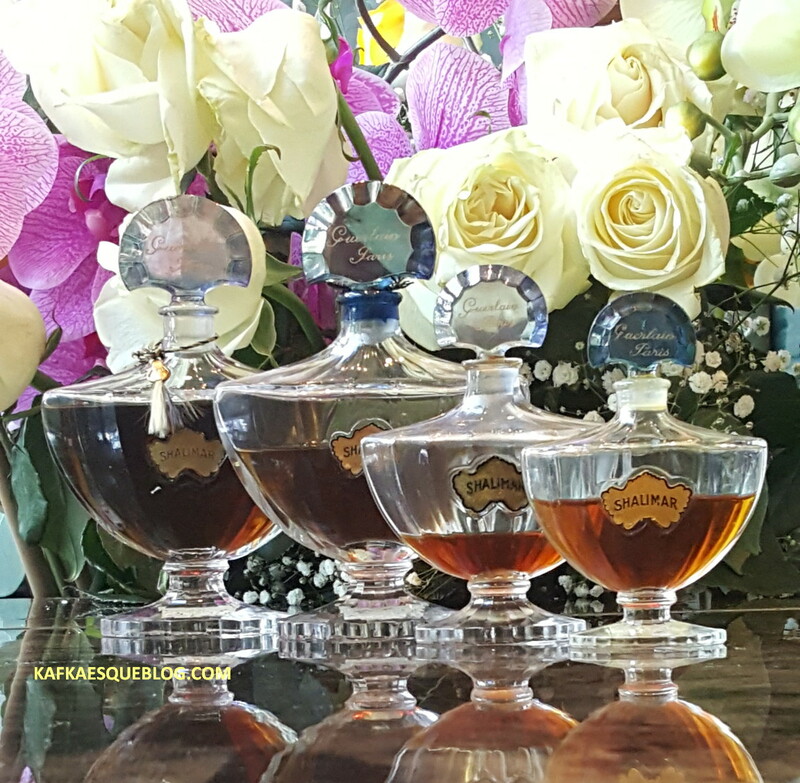 Almost all of us are familiar with the basic gist of Shalimar’s olfactory composition, but the parfum or extrait is exceptional, and The Marly Horse bottles in particular. The latter triggered a sort of madness and obsession in me over the last few months, and ignited a degree of passion that few fragrances — vintage or otherwise — have matched in last 20 years, not even other forms of vintage Shalimar. I’d like to take you down the rabbit-hole with me in this post and its subsequent Parts II and III. Vintage Shalimar in different concentrations. Photo & bottles: my own. If you are a “vintage virgin,” as one of my friends recently put it, there are a lot of factors at play in figuring out where to start when it comes to Shalimar. Not only are there quite a few concentrations — each of which has slightly different nuances and olfactory focus — but, making matters even more complicated, there are differences in scent across the decades, so dating a bottle of vintage Shalimar can make a substantial difference. For example, a 50 year-old eau de toilette may end up being richer, deeper, smokier, and/or more ambered than a 15 year-old vintage eau de parfum. Much of it is the inevitable result of a fragrance reducing and becoming more rounded and concentrated over the years, especially once the lighter citrusy top notes evaporate, but a tiny part of it is due to a minor reformulation of the notes, even for the vintage ones. Even once you’ve decided which concentration of vintage Shalimar you want to buy, navigating eBay with its slew of offerings can be an extraordinarily daunting task. Let’s say you know you want to try the pure parfum or extrait, and you want it to be as old as you can possibly afford. From personal experience, I can tell you that that doesn’t simplify matters at all, and merely opens up an incredibly technical world of arcane and sometimes microscopic differences involving the width of bottle stems, label wording, box designs, batch codes, acid-etching, and more. Thankfully, there are a number of resources available that help you to navigate this minefield, that I used myself, and that I really recommend. I’m hardly an expert in dating vintage Shalimar, but they are. It may all seem very daunting at first but once you get the gist of the basics, it becomes much easier and you can (almost) whip through the thumbnail photos on eBay to dismiss the ones that don’t fit your parameters in order to focus on the handful that you’d like to research further. This may seem like far, far too much work for some — and they would have a definite point — but I truly believe that vintage Shalimar is worth every bit of it when you find the right bottle and, above all else, if you focus on the pure parfum concentration in its really aged form. Unlike so many other fragrances, I think that the parfum only gets better as it gets older, turning into a masterpiece with few equals. Vintage Shalimar parfum. Far left, possibly 1950s/1960s Marly Baccarat crystal vintage Shalimar parfum in a 2 oz size. Left: 2 oz 1960s Baccarat crystal Marly vintage Shalimar parfum. Then, 1970s 1 oz parfum. Far right, 3/4 oz 1970s bottle. Photo: my own. In fact, I’m not being hyperbolic when I say that I’ve smelt nothing as magnificent, as dizzying, staggering, euphoria-inducing, and, yes, I will say it, almost orgasmic as a bottle of 1950s (I think) Marly Horse Shalimar parfum in the flocked velvet box that my mother bought a few months ago. The fragrance’s colour was a dark mahogany colour rather than the fine, burnished cognac hues of my bottles, the liquid was so thick that it was almost as syrupy as molasses, and the scent… the scent… I’m not sure I have the words to actually describe it, but it was like a drug. Vintage Shalimar parfum, probably 1960s, in 2 oz Baccarat crystal bottle with its Marly Horse velvet box. Photo: my own. I’ve tried a lot of vintage Shalimar before and since, in all concentrations and from across the decades — whether 1980s EDP and eau de toilettes, the previous 1970s Shalimar extrait that I owned, or the subsequent Marly Horse extraits from the 1960s (perhaps one being from the 1950s) that I bought for myself — but nothing has ever been quite like my mother’s bottle. Some alchemical magic seems to have occurred, some transformative mix of factors beyond the basic formula or easy explanation. I’ve never smelt anything quite like it and, for me, everything pales before it, including my beloved vintage Opium. 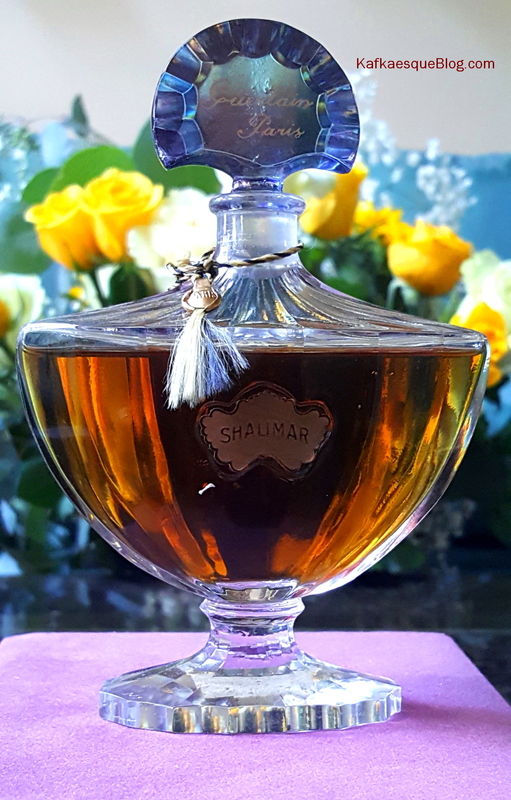 While the right bottle of vintage Shalimar parfum can be a completely transcendental experience, vintage Shalimar still weaves a magical spell and still bears great beauty even if you don’t get the oldest bottle or the richest concentration. That beauty across the types or years is one that the new, modern, reformulated, IFRA/EU-compliant, and arguably butchered versions will never match, in my opinion. Never. Not in a million years. In fact, I’d argue that the utterly ghastly travesty of modern Shalimar combined with the ubiquity of the many, many fragrances that have modeled themselves on Shalimar have made most of us — me included — forget the sheer magnificence and exceptionalism of the original in its vintage form, and particularly in parfum concentration. There are so many Shalimar clones out there, so many repetitions of its famous refrains, that the original has lost its impact. So it’s easy to shrug or dismiss the thought of expending effort in hunting it out on eBay. Personally, and in all candour, I don’t think the weaker or lighter concentrations of vintage Shalimar (like the EDT) are worth a detailed, time-consuming and expensive manhunt unless you see a really old bottle going for a good price (because the age makes such a huge difference! ), but the vintage extrait, that’s a different story. I think it’s special, in all decades, pre-1980s. But a really, really old 55, 60, or 65 year-old Marly Horse bottle… dear God above, there are no words. It’s worth every bit of headache-inducing peering at eBay photos, every bit of patience to find one at a price that doesn’t bust your wallet, every bit of frustration and gnashed teeth at the ones that slipped away, once it’s finally in your hands. It’s worth every bit of everything! 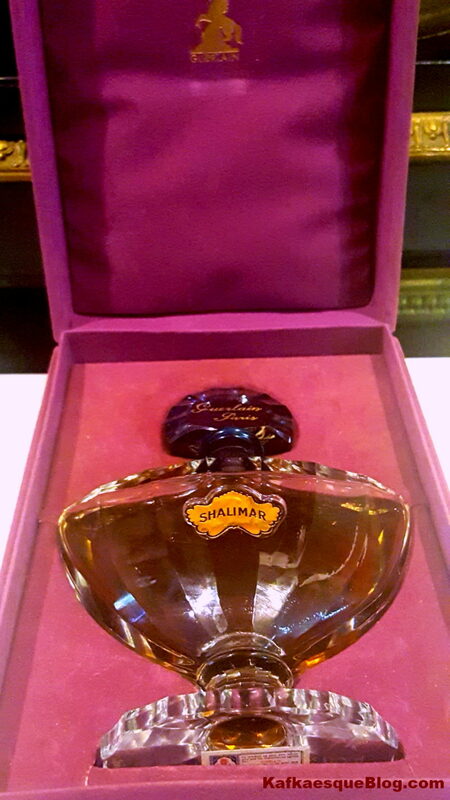 1976 vintage Shalimar Eau de Toilette. Note the ambered colour. That’s not the case with younger versions of the vintage Eau de Toilette. Photo: my own. 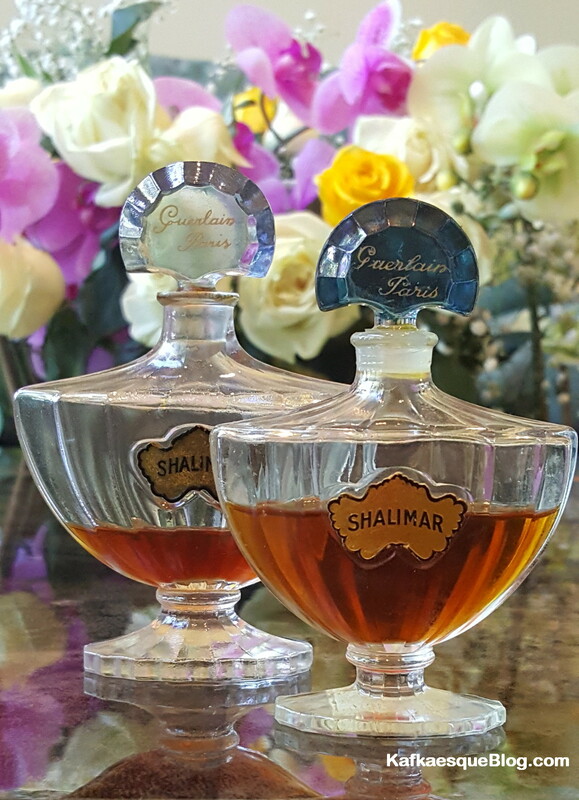 Left: Vintage 1998 Shalimar EDT. Right: vintage 1984 Shalimar Parfum de Toilette, a stronger concentration. Photo: my own. Today, I’ll start by briefly discussing Shalimar’s development, history, and notes (which apply to all of its concentrations), then I’ll tell you the story of the particular 1950s Marly Horse bottle that launched a few months of madness and obsession for me, and we’ll go on from there. bergamot, lemon, jasmine, rose, orris, opopanax [sweet myrrh], tonka bean, birch tar, patchouli, incense, vetiver, civet, castoreum, vanilla, musks. As a side note, The Perfume Shrine adds benzoin, Peru Balsam, and sandalwood to the note list. I would agree when it comes to Shalimar from the 1980s onwards, but not necessarily before. For example, I can’t say that I’ve ever detected sandalwood in the earlier versions, but it’s definitely there in fragrances that I’ve tried from the 1980s. I also completely agree on the two resins, again for the later decades, with the benzoin being a particularly big and obvious presence in fragrances that I’ve tried from the 1980s and 1990s. Separate from those three notes, I personally have always believed that styrax resin is part of the leather accord, at least for the earlier decades of the parfum, and I think that it’s quite evident in one of the 1960s vintage parfum bottles that I own. 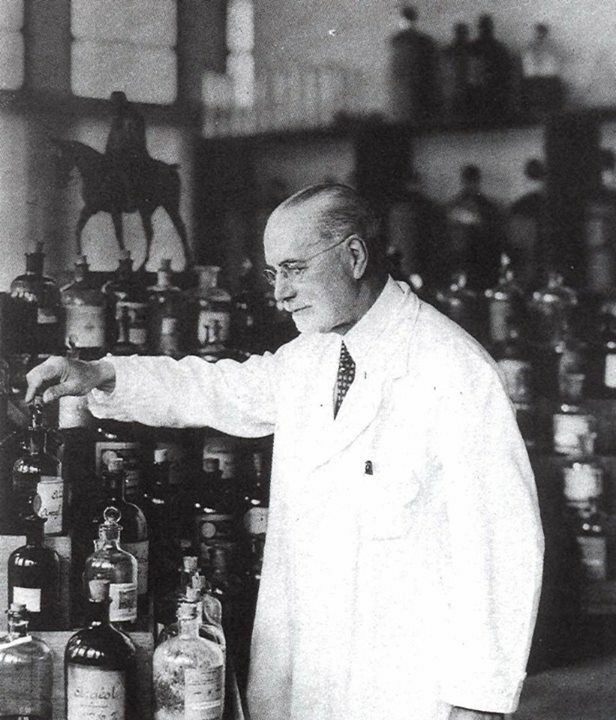 Jacques Guerlain in his lab. Source: Pinterest. 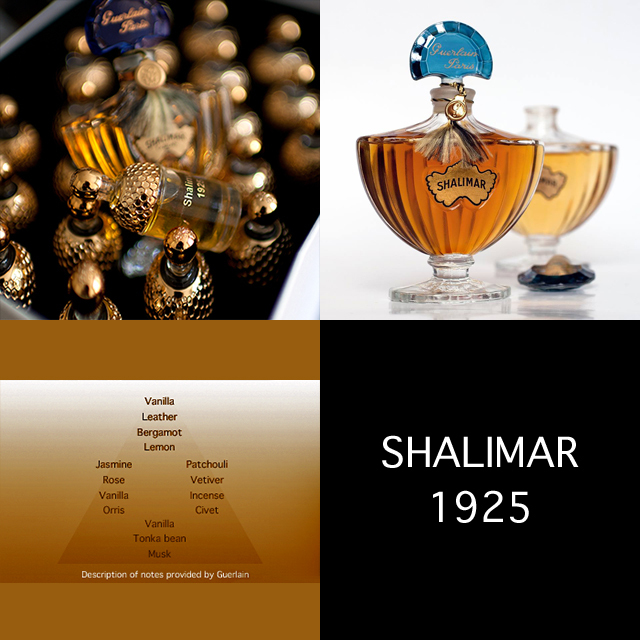 Monsieur Guerlain has a different account of Shalimar’s development and composition. He writes that Thierry Wasser, Guerlain’s current nose, is “not an advocate” of the Jicky-vanillin theory because he thinks the development was much more complicated. According to Monsieur Guerlain (and presumably Monsieur Wasser), the key ingredient was actually ethylvanillin which is relevant because it is “many times stronger and creamier than vanillin.” Because of its strength, Monsieur Guerlain writes that Jacques Guerlain “sequestered himself in the laboratory and worked methodically to try to offset the intense vanilla odour with resinous, powdery and, not least, citrus notes.” As a result, over “thirty percent of his composition consisted solely of bergamot oil.” (Emphasis added by me.) That fact will be relevant to the descriptions of the various types of vintage Shalimar that you’ll find below. I’ve always loved and owned vintage Shalimar, but my current obsession started with a visit to my parents’ house a few months ago. I walked in to find two large rooms filled with an absolute torrent of the most delicious, delectable scent of lemon chiffon mousse drizzled with the best Earl Grey bergamot tea amidst in a positive tsunami of smolderingly dark resins, cognac-like amber, and truly mouth-watering, creamy but dark and boozy vanilla. I kid you not, my head swiveled on its axis like one of the possessed children in The Exorcist. Now, dating bottles of vintage Shalimar is an extremely inexact science in the absence of bar codes which Guerlain only began to use from the 1970s onwards, but there were a few things that strongly suggested my mother’s bottle dated from the 1950s: the fact that many of the collector’s other bottles dated from that time; the Shalimar’s dense and syrupy liquid; the almost mahogany colour of its juice, and the faded nature of the acid-etching on the bottle of its base. We’ll get into the specifics of all those things in Part II, but the point for now is the bottle is probably around 65 years old and that made a huge difference to its aroma as well as to its strength. I wish I had a photo to show you but my mother is a protective of her Shalimar after accidentally spilling some on the table while trying to open the bottle when she got home. My parents later told me that that small amount had such a powerful aroma that it filled the house for as long as four or five days. It seemed to mesmerize everyone who came into contact with it, including my father, a man who loves fougères and citrusy fresh fragrances, and who does not normally gravitate towards the Oriental or Floral Oriental genre. He was so spellbound that he sniffed the air rapturously and put some on as well. Its impact on me up close was even more intense and complex than the aroma wafting in the air. I sniffed the stopper and thought my heart was going to stop. The opulence of its bouquet is beyond my ability to describe, but I shall do my best because not even my own old vintage Shalimar extraits have come close to the sheer degree of staggering, dizzying, utterly toe-curling, staggering beauty of that 1950s bottle. It had a genuinely euphoric physical, emotional, and mental effect on me that increased with every sniff, and I’m convinced that the scent actually triggered both dopamine and endorphins in my brain. (See, the neurotransmitter and psycho-aromatherapy section in my post, AbdesSalaam Perfume Course – Part I: The Pre-Course, Theories & Philosophy.) The fragrance almost seemed to elevate my spirits and mood in a way that sounds utterly ludicrous, hyperbolic, puerile, and infantile unless you’ve gone through it. Hell, I’m writing the words and cringing at how ridiculous it all sounds, but that bottle… that bottle…. it was like nothing that I’ve ever encountered, before or since, and I actually owned several different types of vintage Shalimar beforehand, including a 45 year-old parfum from the 1970s that I rushed to smell when I got home. No, it was not even remotely as glorious. And the various vintage Eau de Toilettes or Parfum de Toilette bottles certainly were nothing alike. None of them made me feel as though fireworks were going off in my head to the opening music of Beethoven’s Fifth before transitioning to Ode to Joy from the Ninth, but that was precisely the emotional power and impact of my mother’s bottle on me when I wore it. So what was it that put this one bottle on a whole other solar plane of olfactory existence? It was partially the concentrated heft of its individual notes and the complexity of the scent, but those are only partial explanations. My mother’s 1950s Marly Horse bottle of vintage Shalimar opens on my skin with a thick torrent of glittering rubied roses that are heady, sweet, practically beefy, and chewy. Entwined around them are jasmine flowers so lush, sensuously heated, musky, and syrupy that they glow like yellow canary diamonds. Puffs of smoke trail from their indoles and merge into the smoke from incense and leather. The latter is a deep, powerful, and increasingly prominent note made up of castoreum and birch. It feels as raw as a Russian cossack’s Cuir de Russie-style boots and, yet, enormously smooth and polished at the same time. Ripples of spice emanate from the patchouli and resins in the base, weaving up slowly and sinuously to fuse with the smoke from the leather and incense. The entire bouquet lies under a heavy blanket of boozy, dark vanilla infused with bergamot that smells like smoky Earl Grey tea layered with the fluffiest, airiest, creamiest, and most fragrant lemon chiffon mousse. There is so much going on that it’s almost dizzying, but each piece clicks into place perfectly, moving so gracefully and seamlessly that they’re like a ballroom of perfectly synchronized dancers in a waltz, gliding across the air and my skin in perfect harmony. The only problem, if you could even call it that, is that each individual note is so opulent, so potent, and so mesmerizing, that neither my nose nor my mind can figure out which one to single out for a deeper, more indulgent sniff. All of it feels as rich as an attar and, yet, paradoxically, also feels almost weightless because of the way each note dances in the air. They are so dense, strong, and crystal clear that they practically become visible in the air, luminous, radiant, chewy, majestic, elegant, and sensuous all at once. 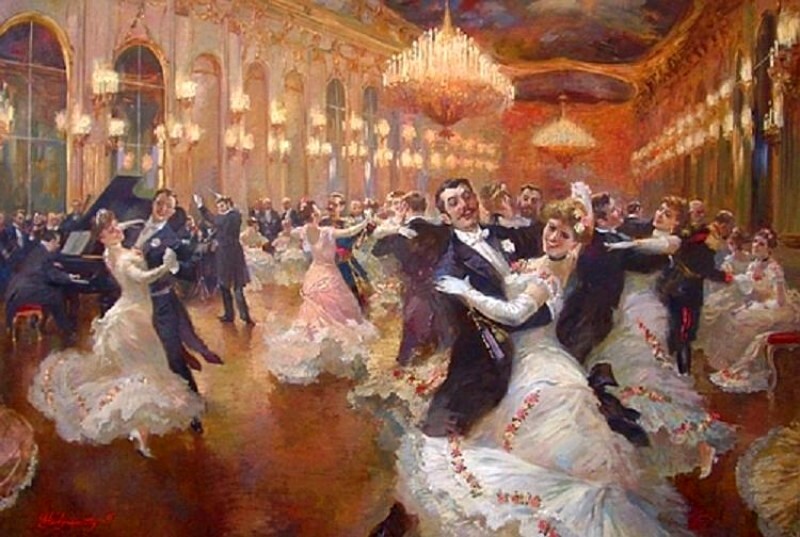 “The Viennese Waltz” by Vladimir Pervunensky, 2007. Source: Pinterest. For all its sophistication, the bouquet is not an aloof or haughty one but so warm that it invites you in, beckoning with fingers of vanilla and amber, tantalizing you with a bared shoulder that is naked, musky, and heated. It also hits the perfect balance between masculine and feminine notes. The femininity of the glittering floral jewels is contrasted with the masculinity of the leather, incense, and dark musks, the black tuxedos in this tale. The dancers waltz under the bright light and crystal chandelier of the bergamot, its drops sparkling like effervescent champagne, while the vanilla forms the silken ivory walls within which this entire scene takes place. There is such majesty and splendour to the bouquet, its visuals, and its individual parts that, whenever I smell my mother’s bottle, it always makes me think of tsarist palaces, the ballrooms of War & Peace, and the Imperial Romanov court. There is just a scale to this thing, particularly in its opening hour, that you have to experience for yourself to believe. All the Marly Horse vintage Shalimar bottles that I’ve tried are what I call “prismatic” compositions in their development — fragrances that radiate different notes and nuances each time you wear them, rarely following the exact same course twice — but the 1950s bottle is particularly hard to pin down. It changes like a kaleidoscope for hours on end, each note crystal clear but flowing one into another like ripples on a lake. For the first three hours, though, four of them constantly compete for the spotlight and the lead: the rose, the bergamot lemon chiffon mousse, the leather, and the vanilla. Later, the jasmine replaces the rose as the dominant flower, and pushes it to the sidelines. At the same time, the incense joins the dancers on center stage. However, the balance of notes and the focal point of the scent as a whole is gradually shifting towards the vanilla. Roughly 3.5 hours into the fragrance’s evolution, it seeps over all the other notes, tying everything together with a creamy sweetness and starting what seems to be Shalimar’s second stage. The vanilla is boozy and infused with a multi-faceted smokiness from the leather, the incense, the jasmine’s indoles, and the castoreum. At the same time, the resins and amber rise up from the base, adding yet another layer of richness and warmth. In the drydown, the smoky vanilla and the ambery resins take over completely. The central accord is flecked by a sliver of the delicious bergamot mousse and a small drop of syrupy floralcy, then enveloped within a warm, slightly leathery, golden muskiness. However, when smelt from afar, the dominant chord is primarily the dark, smoky, but also creamy vanilla. 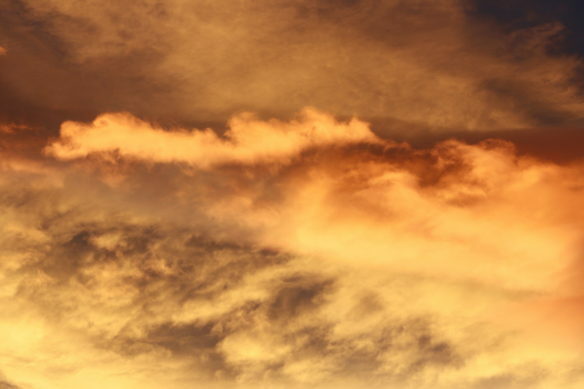 In its final hours, all that’s left is a golden warmth and sweetness. The longevity, sillage, and projection numbers were very good given the small amount that I applied. With three tiny, light smears, the 1950s vintage Shalimar opened with 3-4 inches of projection and about 5 to 6 inches of sillage which soon grew to about 10-11 inches after 30 minutes. 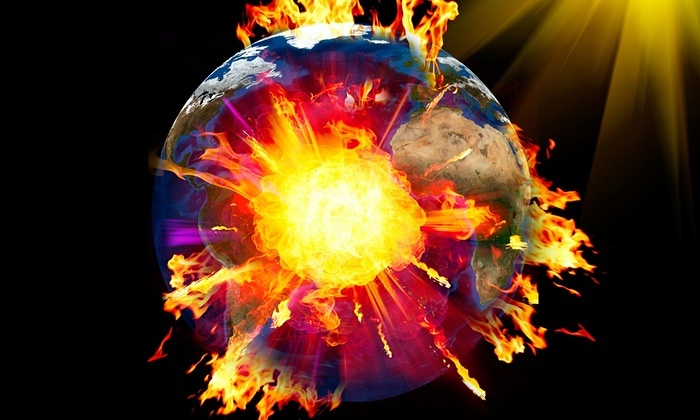 Both numbers went down incrementally over the next 3 hours, and the projection was quite soft at that stage, but the sillage continued to be intense until the middle of the 4th hour. In total, it took almost 6.75 hours for 1950s Shalimar to become a skin scent, and it lasted just short of 14.5 hours. Vintage Shalimar. Far left and left, 2 oz 1960s (?) Marly bottles. Then, 1970s 1 oz bottle. Far right 3/4 oz 1970s bottle. Photo: my own. Vintage Shalimar parfum, 1960s but perhaps 1950s, in 2 oz Baccarat crystal bottle with its Marly Horse velvet box. Photo: my own. 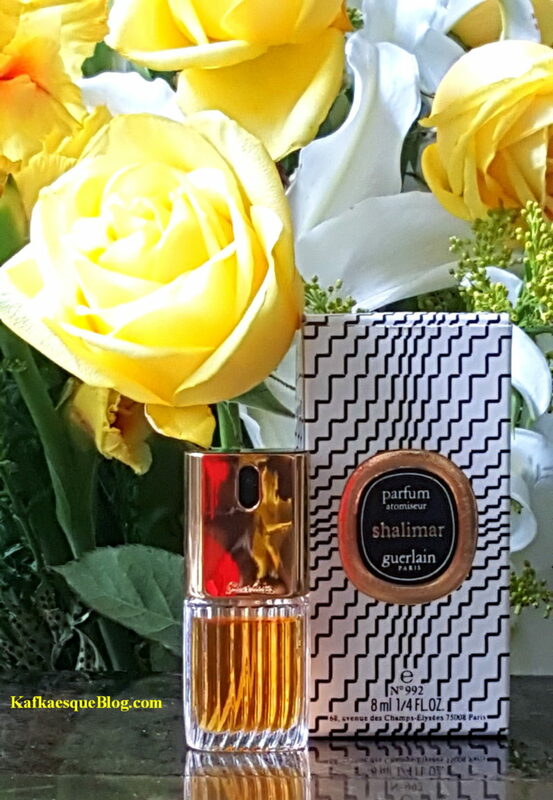 The “1960s” vintage Shalimar parfum opens on my skin with bergamot that smells like a richer, darker, and denser version of the scent found in Earl Grey tea. It’s engulfed with surprising speed by a musky, animalic, smoky, and woody leather accord that is redolent of charred birch wood, its ashes, campfire smoke that is almost like that of a barbecue, and an astonishingly dark, almost raw castoreum leather. Curlicues of civet and a highly woody myrrh festoon the leather’s edges, while a slew of resins dominated by smoky styrax snake around under it. What strikes me is how much more complex the leather note is here than in my mother’s bottle, how nuanced and multi-faceted, but also how much woodier and more masculine the scent is as a whole. The bouquet changes within minutes. The bergamot retreats to the background where it’s noticeable mostly when I smell my arm up close. A dry, dusty, slightly withered rose takes its place as a prominent layer within the leather. To my surprise, there isn’t a strong and obvious vanilla note anywhere in sight for much of the opening. It’s probably working its magic indirectly from afar, particularly on the bergamot with which it’s typically intertwined, but this bottle of vintage Shalimar skews mostly towards the leather, rose, and animalics rather than the more common bergamot-vanilla pairing. Gary Cooper, 1938. Source: Pinterest. Still, like my mother’s bottle, the notes dance in the air, sinuous, lithe, radiant, deep, and rich — except these ones purr and growl as well. The dark musks and furry animalics, particularly the castoreum, are an integral part of the woody-smoky-leather accord, but they’re just as evident in their own right and to a significantly greater degree than in my mother’s bottle. The different focus and balance of notes ends up evoking completely different images than the fin-de-siècle, waltzing, tsarist ones that I described above. 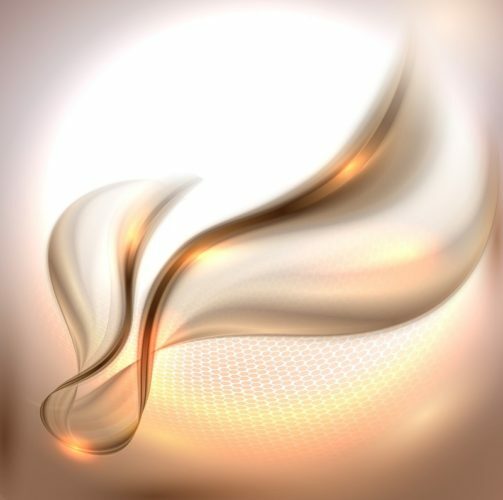 I once saw an episode of the updated television series, Upstairs, Downstairs, set in the 1930s, where a cool, enigmatic, aristocratic beauty sat in her slinky silver lamé dress at her mis à toilette table, dabbing on her signature scent, Shalimar parfum, and the image stayed with me, but I think the scent of this 1960s/1950s bottle might suit her husband far more. 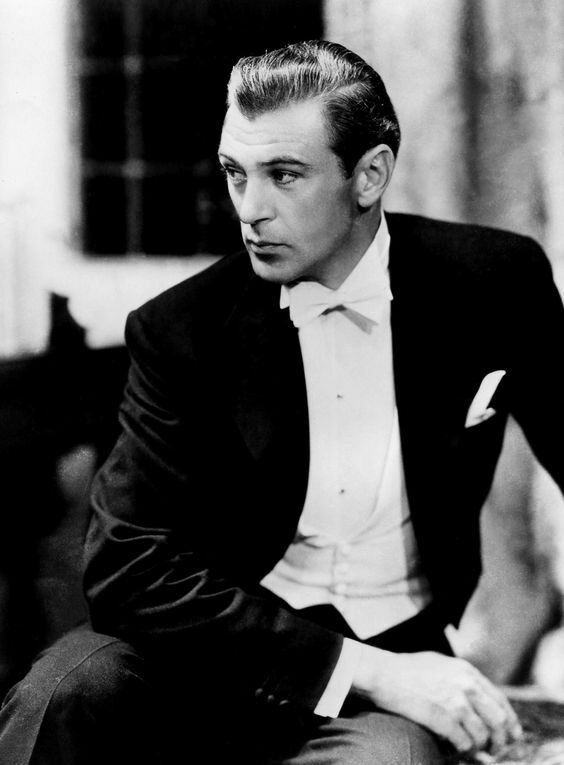 Actually, it would be a perfect fit for the famously debonair and handsome screen icon, Gary Cooper, in his white-tie tuxedo. Yet, the notes fluctuated so much that it was difficult to pin things down. At times, the incense’s smoke was just as strong as the leather. Sometimes, the rose acted as the leather’s main companion, sometimes it was the musks, though both were replaced much later on by the jasmine. At times, the birch seemed to be the leather’s strongest component, turning its aroma towards to the woody and campfire smoke side; at other times, it was the castoreum which dominated, thereby rendering it musky and slightly skanky. The bergamot was the most fickle of the lot. At times, it was fully fused with the vanilla; at other times, it seemed to disappear completely before unexpectedly roaring back with great strength. Sometimes, it wafted Earl Grey tea more than creamy lemon chiffon mousse; sometimes, it wafted both. So many things simultaneously radiate muskiness, sweetness, dryness, smokiness, darkness, and golden warmth, that the scent is ferociously potent and intense up close during its first 3 hours. When I applied several dabs, equal perhaps to 2 small sprays from an atomiser type of bottle, this Marly vintage Shalimar opened with about 4 inches of projection and about 5-6 inches of sillage that soon grew to 11-12 inches. It was so powerful that it almost gave me a headache when I sniffed my arm up close for too long during the first 30 minutes. It’s the sort of scent that radiates with such boldness and richness that, once again, I felt as though I could practically see waves of notes concretely and visibly pulsating out in the air. With a smaller application amount, the fragrance is less of a powerhouse and sits closer to the skin, comparatively speaking, but this is a fragrance where a little goes a very long way. Regardless of quantity, though, and just like the scent in my mother’s bottle, there is an odd juxtaposition and polarity where the scent is shimmering and almost weightless and, yet, incredibly dense, viscous, and heavy in weight at the same time. The 1960s/1950s vintage Shalimar changes in incremental steps. The scent turns softer, rounder, and sweeter about 1.75 hours into its development. The leather’s edges are blunted by a greater floralcy, in large part due to the arrival of the syrupy, rich, golden jasmine. The incense has also been softened and is now shot through with orris and vanilla. (At this point, the fickle bergamot is temporarily in hiding, though that is rarely the case for long.) By the middle of the 3rd hour, the fragrance smells mostly of musky, lightly smoky, faintly animalic leather enveloped within boozy and equally smoky vanilla. When I smell the fragrance from afar on the scent trail, it wafts amber in the background but, up close, it’s barely evident. Instead, what appears are the syrupy jasmine and woody birch. About 3.25 hours in, the sillage and projection numbers drop quite a bit. The projection is about 1.5 to 2 inches, while the sillage is close to the body unless I move my arms, in which case, it radiates out with continued force, forming a cocoon that envelops me. Vintage Shalimar continues to change over time. When the 4th hour rolls around, the bergamot replaces the leather as a main note on central stage, but the vanilla is even more significant and becomes the real focal point of the scent. It’s simply fantastic: smooth, sultry, lush, and deep, it’s layered with booze, incense, ambered resins, and bergamot that smells like both Earl Grey tea and lemon chiffon cream pie. A rich jasmine syrup is drizzled on top, thin streaks of leather and dark musks nuzzle its edges, and a haze of ambery warmth hangs over them all. This is essentially the drydown phase, and it continues for quite a while. The notes eventually grow blurry, overlap, and simplify. At the end of the 8th hour and start of the 9th, there is only an ambery vanilla laced with wisps of smoke. The fragrance eventually dies away as nothing more than golden sweetness. It lasted 13 hours in total, but I have to stress that I didn’t apply much fragrance. As a side note, my second bottle of vintage Shalimar in the Marly/Baccarat packaging (the one that dates to the 1960s with more certainty), is quite different in scent and feel. It is nowhere close to being as dark, leathery, woody, musky, or animalic. It is also not as opulent, complex or deep as either of the two bottles that I’ve described thus far. Its aroma, balance of notes, weight, strength, overall vibe, and the colour of its juice skews midway between the more floral, less leathery aromas of my mother’s 1950s bottle and the 1970s parfum that I owned originally, except its richer and heavier than the latter. I find its notes to be much more rounded as well, particularly its bergamot. However, if I had to choose one bottle that it resembled most in terms of its scent and notes, then I think it skews closer towards the my mother’s 1950s one than to either the 1960s/1950s bottle or any of my 1970s ones. 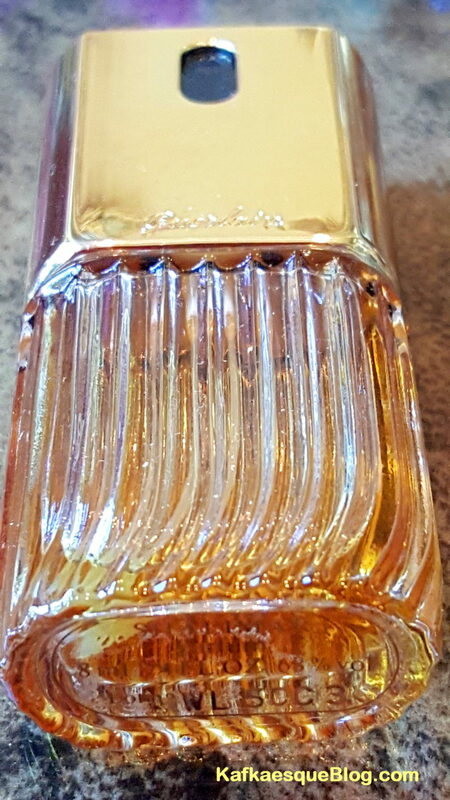 1970s vintage Shalimar parfum. Back and to the left, possibly an older bottle, 1 oz in size. Front and right is possibly an earlier 1970s bottle, and it looks like it’s 3/4 in size. Photo: my own. I have two bottles from the 1970s, and they resemble each other enormously in scent. The original one that I owned is a 1 oz bottle that I bought on eBay, and the seller thought it might be mid-to-late 1970s, perhaps because it doesn’t look to be heavy Baccarat crystal. A recent 3/4 oz bottle I bought is Baccarat, however, and the words etched on the bottom of its base are done so in acid (which is one indicator of age as you will see next time in Part II). However, age has made the words faint enough that I’m guessing this bottle might be a bit older and is probably early 1970s (?). I’ll give you the scent description of the other, possibly mid-1970s one. This bottle of vintage Shalimar opens with a deep rose and jasmine bouquet, sandwiched between multiple layers of citrus led by a dense, slightly raw smelling bergamot oil, followed by some bright, slightly sharp lemon. 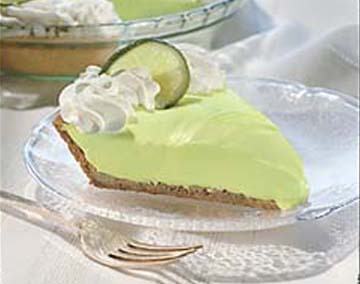 The two citruses combine together to give the sort of tart intensity that one finds with lime, and with Key Lime pies in particular. The bouquet lies on a thin layer of leather coated with civet and castoreum. The citrus accord outweighs everything else by a 2 to 1 margin. 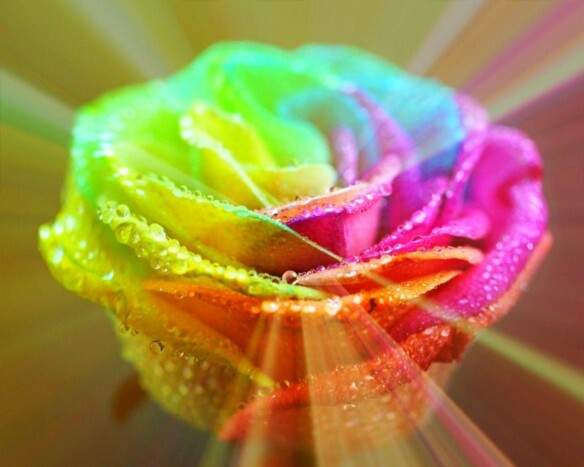 The rose is the second most powerful note. The civet rapidly takes third place, followed by the jasmine and castoreum in that order. There is no incense and the tendrils of smoke come largely from the indoles wafted by the jasmine with only a small part coming from the castoreum leather. There is no vanilla in the opening, either. For the most part, the scent trail exudes only a deep, musky rose drenched in huge amounts of bright, robust, slightly sharp and almost lime-like bergamot. Up close, the different types of musk and skank (like the castoreum) are clearly visible in individual form, and gradually grow in strength. In the background, there is an occasional pop of sweet myrrh, but it’s heavily muffled by the main rose-bergamot accord. The 1970s vintage Shalimar doesn’t change rapidly or often in its first 30 minutes. 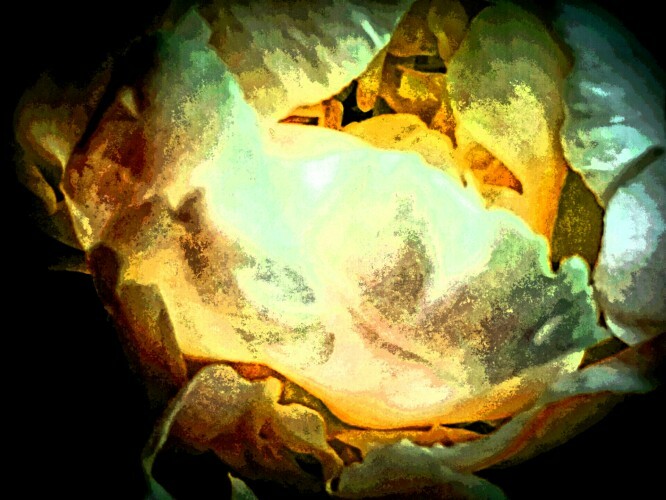 The two citruses take the lead, swaddling the rose like a beloved newborn. The jasmine and opoponax try valiantly to be noticed, but they’re muscled out by the castoreum. It soon swallows up both the civet and leather to form a single, smoldering ball of leathery muskiness. All of it feels quite different from the older versions of vintage Shalimar parfum that I’ve described. Unlike my mother’s 1950s bottle, there is no vanilla in the opening. Unlike the 1960s/1950s version, there is zero sense of woodiness or campfire smoke to the leather, and no clear, distinct incense. In addition, the bergamot smells extremely different to the ones in either of those two scents. It feels almost raw, in addition to being sharper, crisper, and greener. It has no Earl Grey fragrancy during the first 90-minutes, none whatsoever. Instead, it bears the sort of bitter, aromatic freshness that you encounter when you run your nail through a citrus rind and its oil squirts out. It’s hardly an unpleasant thing but, for me, personally, it’s not as appealing, interesting, inviting, or complex as the one in the older parfums. On a broader level, another difference between the 3 bottles is that, instead of a dizzying array of notes happening simultaneously, there are essentially only two competing chords to the scent, each one made up, in turn, of two notes of its own: citrus-rose and leather-musk. Strange as it may seem, the 1970s fragrance somehow feels flatter, duller, less vibrant, cooler, and more indistinct — both in terms of its individual parts and its overall bouquet. I would have expected it to be the reverse since, usually, older fragrances may be more rounded but they’re also blurrier at the edges, their notes having condensed over time to fuse together and to thereby lose much of their vivacity, brightness, and individual delineation. Here, though, to my surprise, it’s the reverse with the newer 1970s scent being flatter and having less sparkle. 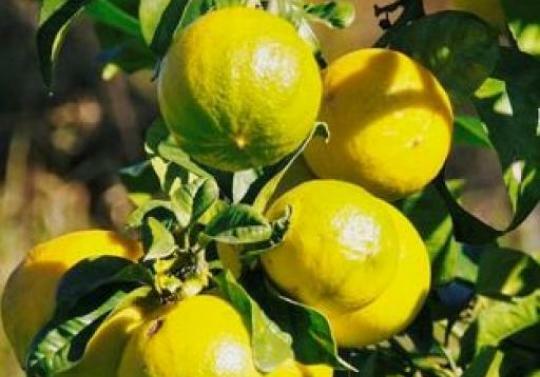 On the other hand, the rawness of the bergamot is typical of “younger” fragrances. It lacks the creaminess or aerated fluffiness of the bergamot in the other two or three fragrances, and I think the vanilla’s absence (in the opening 90 minutes) is only partially responsible. I wouldn’t be completely surprised if a different type or grade of bergamot had been used given the absence of any Earl Grey aroma. Then again, a possible explanation might be that the fact that the lemon top note has not evaporated from this “newer” and “younger” version of vintage Shalimar, so it’s accentuating the bergamot’s more citrusy tonalities. Roughly 35-40 minutes in, the 1970s vintage Shalimar shifts its focus. The leather — now highly skanky, musky, and almost raunchy in aroma — takes the lead, followed by the citrus-rose combination. There is a huge increase in the level of smokiness but it’s an amorphous, shapeless cloud, and it’s unclear if it stems from the birch, the indoles in the jasmine, the opoponax, the castoreum, or some combination thereof. To my surprise, quite a few of the notes feel blurry, a haze of citrusy floral leather, muskiness, sourness, sweetness, and smokiness. Be that as it may, it’s still a beautiful bouquet and very rich. It’s simply not exceptional and breath-taking like the older version of vintage Shalimar. If my mother’s 1950s one rated a solid 10 (or 11) out of 10, then the 1960s one would be an 8.5 and this would be a 7. But that is all relative to the standard set by my mother’s bottle. If I were to smell this 1970s version next to 80% to 90% of modern fragrances, it would rate a 9 or 10 in comparison. The fragrance gets better and better as it develops. Roughly 90 minutes in, the vanilla arrives and instantly transforms the bergamot/citrus blend into something smoother, creamier, softer, and more rounded in feel. The incense finally appears in recognisable, solid form, too. At the same time, the rose and leather take several steps back, letting the other notes shine. The end result is a bouquet centered primarily on bergamot and smoky, incense-laden vanilla, then framed at the edges with rose, jasmine, leather, and animalic musks. It’s an extremely chic, smooth, and almost delectable mix of smoky sweetness layered with tart, tangy citrus brightness, smoky leather, lusty musks, and rich, syrupy florals. By the end of the third hour, 1970s vintage Shalimar is largely a vanilla jasmine floral layered with Earl Grey and lemon chiffon bergamot cream, then licked at the edges with incense smoke, leather, musk, and a new arrival, resinous amber. After that, it follows the same path laid out by the other versions that I’ve described. The smoky vanilla takes over more and more, layered with ambered, balsamic resins, before the whole thing ends as golden sweetness. Its longevity and projection were roughly the same as the other versions, but its sillage was less intense, far-reaching, and powerful. Vintage Shalimar Parfum in an 8 ml or 1/4 oz atomiser bottle with a “zig zag” or zebra box. The bar code is “WL 5 CC 3” and the letter “W” indicates a 1985 release date. Photo: my own. 1985 vintage Shalimar parfum, 8 ml atomiser spray bottle. Photo: my own. This 1980s version is basically the Shalimar that we’re all so familiar with today, that instantly recognisable signature centered on a central trio of notes: smoky vanilla and bergamot/lime imbued with lush, syrupy jasmine floralcy. To me, it feels like a daughter to the older Shalimar parfums that I’ve described, not their equal. Roses? Forget about it. In fact, years before I bought my original 1970s extrait, I would see “rose” in the Shalimar note list, and I wondered to myself what they were talking about. “What roses? !” I tried to convince myself that there were flutters of it in the various vintage non-parfum concentrations that I owned, but no, the floralcy was really just a jasmine one on my skin and to my nose. As for the other notes on the list, the leather was minimal and largely a thin layer in the base, while the animalics were so minor and muted as to be practically irrelevant. So, for me, “Shalimar” had always been a smoky vanilla with jasmine syrup and lemon/bergamot chiffon pie that eventually turned into smoky, ambery vanilla with tonka powderiness. It was not until I tried the 1970s extrait that I realised what a wealth of treasures were either barely visible or completely missing, at least on my skin and with the bottles that I owned. Really, I was quite stunned to find that roses were such a monumental part of the scent, not to mention the animalic leather and musks. But you wouldn’t know that if you only tried my 1980s vintage parfum. You wouldn’t experience those treasures and riches at all, I’m sad to say. My 1980s vintage Shalimar opens with bergamot that now smells completely raw, instead of just partially so like in my 1970s bottles. 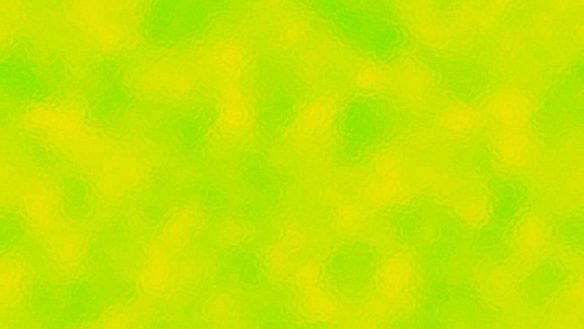 It’s practically neon bright in colour visuals, and imbued with a strong lime aroma. All of it is far, far sharper than the 1970s bergamot, and a whole galaxy removed from the 1950s or the 1960s/1950s one. A light, thin streak of boozy and intensely smoky vanilla runs through it, but the vanilla is hardly a major note at this point. I wouldn’t even call it a secondary note. Moments later, leather begins to ripple through the base, smelling more like the chamois sort found in Peau d’Espagne than Cuir de Russie style birch leather. It’s slightly musky, just barely animalic, but most of all, it’s buttery. It’s as though beige, soft sandalwood supplemented the leather accord, in addition to a heavy, big dose of orris and tonka, while the birch had been reduced down to only a small quantity. Even so, the leather is a quiet, muted touch, and its presence soon disappears under the gale force winds of the raw bergamot oil. Lemon and possibly a completely separate but unlisted lime note add to the briskness and the brightness of the scent. I wasn’t keen on this opening at all. Thankfully, 1980s vintage Shalimar improves a bit, although it does take some time and a number of the changes are quite incremental in nature. Roughly 10 minutes in, the jasmine pops up on the sidelines and its sweetness is a much-needed counterbalance the citruses. The vanilla grows fractionally stronger as well. The cumulative effect is a fragrance that smells like a Bergamot and Key Lime pie which has been lightly drizzled with a few squirts of jasmine syrupy and smoky, slightly boozy vanilla, then placed atop a musky, leather-suede-woody base. If I had to make a rough approximation of the breakdown of notes, I’d estimate 60% would be the citruses; 15% would be the syrupy, sweet jasmine; 15% would be the incense-y, smoky vanilla; and the remaining 10% would consist of the mixed leather/suede, sandalwood, orris, birch, musk accord in the base. I must say, it’s far too much citrus and also far too sharp for my personal tastes, and I wasn’t happy at this point with my purchase at all. I was also disappointed with the weight, strength, and feel of the scent. It seemed more like an eau de parfum than a pure parfum, even without comparison to the older bottles. The scent itself was strong at first, but it was surprisingly light in weight and body from start to finish. Had I smelt it blindly and without knowing the concentration, I would have guessed it was an eau de parfum. The 1980s parfum continues to change in small, gradual steps. It takes a full 60 to 75 minutes for the notes to pipe down and to start feeling more balanced. The numerical breakdown changes at the same time to roughly: 40% citruses, 30% syrupy jasmine, 20% smoky vanilla, and 10% musky leather suede. About 2.75 hours in, the second stage begins. The tonka, benzoin, sandalwood, and orris rise up from the base, join the main players, and slowly grow stronger. With every step they take forward, the jasmine, bergamot, and leather take a step back. By the time the 4th hour rolls around, the latter have retreated to the sidelines. By the start of the 5th hour, they’re mere specks in the distance. What’s left is centered predominantly and primarily on a minimally smoky, minimally boozy, dark vanilla infused with ambery resins, tonka, and sandalwood under a coating of vanillic tonka powder. In all candour, it feels somewhat bland. It’s pretty, but also pretty nondescript. It’s a nice, pretty, but bland powdery amber vanilla with some minimal elements of smoke, woods, and floral sweetness. To me, it doesn’t read as opulent, rich, deep, or deeply cozy. I think the problem is that the vanilla is neither rich enough nor deep and intense enough to feel really indulgent. It’s the exact same problem with the amber, too. It’s both too light, too minor, and too inconsequential to really transform the scent into something deeply enveloping, cozy, and balsamic. 1980s vintage Shalimar doesn’t develop much more beyond this point. It simply becomes more abstract, the notes turning into a blur of powdery, ambered vanilla laced with smoke, tonka, benzoin, and faint, whispery traces of sandalwood. It’s dry, sweet, powdery, quietly smoky, and resinous. By the start of the 7th hour, the fragrance is a mere wisp of powdery tonka, benzoin, and vanilla, and extremely sheer in feel. Not long after, it dissolves into simple powdey, ambery, vanillic sweetness. It dies in much the same way. The 1980s parfum had much lower numbers for longevity, sillage, and projection than the older bottles, even though I was spraying, not dabbing, and atomization usually extends the reach or power of a scent. With 3 spritzes roughly equal to 2 good sprays from an actual bottle, 1980s Shalimar opened with roughly 4 inches of projection and 6 inches of sillage. After only 75 minutes, the projection dropped to 2 to 2.5 inches, while the sillage became 4-5 inches. By the middle of the 3rd hour, the fragrance hovered above the skin. It became a skin scent about 5.75 hours into its development. I had to really dig my nose into my arm to detect it by the 8th hour. In total, it lasted just shy of 10.25 hours. Vintage Shalimar Parfum, 1950s or 1960s, 2 oz, Marly horse purple velvet box. Photo: my own. 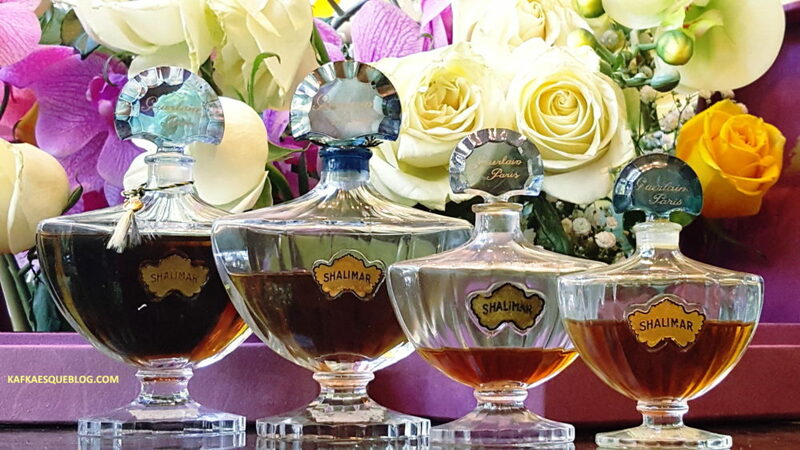 As you can see, not all vintage Shalimar parfums are created equal in terms of their scent. And you won’t know what you’re getting until you smell it. If this account of the oldest bottles has gotten you excited and you plan to scour eBay tonight, I’d advise you to wait until Part II. Just because the bottles in the Marly Horse purple flocked boxes are the most renowned, that’s no guarantee of what you’ll get, either. I’ve seen some that are a bold imperial purple (rather than being faded to a dusty mauve), are accompanied by the outer “zig-zag,” zebra, black and white box casing, and seem to date from the late 1970s or early 1980s. I would be quite surprised if they smelt like the older Marly fragrances that I’ve described. While there are a few other ways of telling age that might — maybe, possibly, hopefully — help to pinpoint things further (and that I’ll talk about in Part II), one also cannot dismiss the issue of how the previous owner stored the bottle and the care which they may have taken to prevent light, heat, or other factors from impacting the scent bouquet. Having said that, though, if someone owned a Marly and/or Baccarat crystal bottle of vintage Shalimar parfum, there is a high likelihood that it was treasured, beloved, and treated with great care. So, we’re back to square one and to the need to date things in order to find the oldest possible bottles. The thing is, the weaker concentrations suit a completely different need and purpose than the pure parfums. 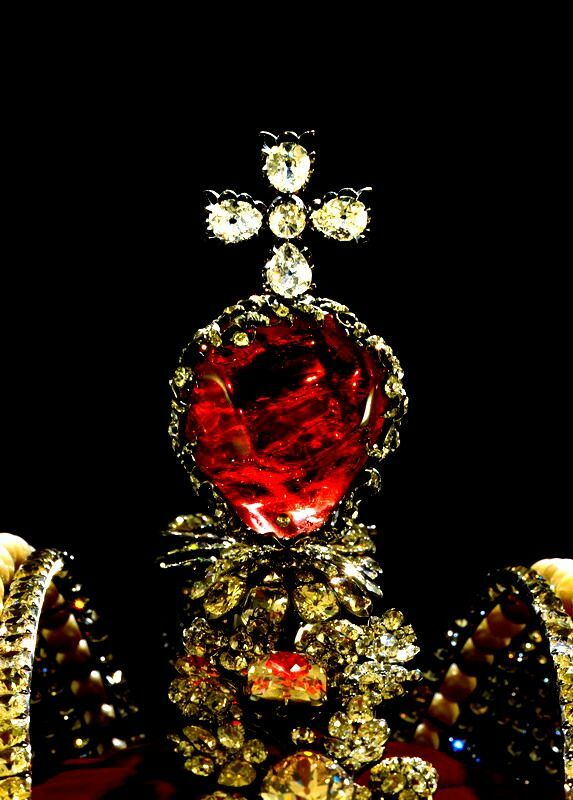 The latter are dramatic, intensely opulent, powerful, potent, and complex masterpieces with a va-va-voom nature and a diva personality. They grab your attention as well as that of anyone around you. They’re glamour fragrances that are best suited for when you want to dress up and stand out in a crowd, or when you want to really indulge yourself in luxury. So, in that sense, they’re not particularly versatile, or something that you could easily wear every day. In contrast, the other concentrations (if you get an old bottle), are delectable, wonderfully snuggly, cozy comfort scents with a simpler nature, a lighter weight, and a softer personality. For me, something like my 1976 EDT is perfect to use at bedtime and to scent my sheets. I’m a firm believer in sleeping in scented sheets, but who wants to do that with a very rare and expensive bottle of pure parfum, particularly one that commands — nay, demands — your complete and worshipful attention, and that doesn’t turn restfully demure for hours on end? So, depending on your personal tastes, note preferences, needs, purposes, and the weight or heaviness of the fragrances that you’re accustomed to, a lighter version of Shalimar may actually suit you much better than a parfum. But no matter what type of Shalimar you want, nothing will ever change my firm belief that, on an olfactory basis, older is better. So, next time, in Part II, we’ll explore the other concentrations, and I’ll go through the basics of dating your bottle. If you’re a Shalimar “vintage virgin,” my hope is that, between these two parts, you’ll find a bottle that will be perfect for your tastes. 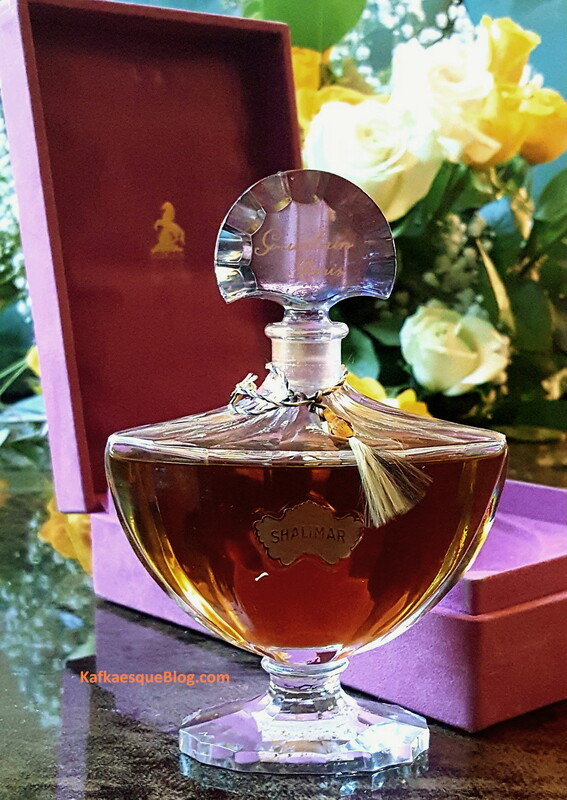 This entry was posted in Floral Oriental, Guerlain, Orientals, Perfume Review, Vintage Fragrances and tagged Baccarat crystal Shalimar bottles, Dating Shalimar bottles. Dating vintage Shalimar on eBay, Guerlain batch codes, Guide to Vintage Shalimar, Guide to Vintage Shalimar by year or bottle, How to date Guerlain bottles, How to date vintage Shalimar, How to recognize vintage Shalimar, How to tell Shalimar apart, Marly Horse Guerlain bottles, Marly Horse purple boxes, Marly Horse vintage Shalimar, Shalimar Baccarat crystal bottles, Shalimar Marly Horse bottles, Vintage Guerlain box differences, Vintage Shalimar, Vintage Shalimar Extrait, Vintage Shalimar Parfum, What are the differences between Shalimar concentrations by Kafkaesque. Bookmark the permalink. Thank you SO much for this INCREDIBLE, thorough discussion. You have a superb nose and superb writing ability… Just first class. SHALIMAR is basically my “signature” fragrance, and I’ve been wearing the current EDP for about ten years now. About 7 years ago someone gave me a decant of some 1963 vintage extrait. And exactly as you say… it is narcotic, nigh molasses-thick, almost a “liquid heroin”, and it makes one just about go cross-eyed and weak-kneed with its staggering beauty. Unlike today’s versions, which have an ambery, citrusy “sprawl”, it was very “unified”– all the notes absolutely melted into one another. No one note stood out. One big impression I got of it was that it seemed “mousy” to me. More overtly animalic than the current brew. It had a cunning “brown and furry” scent, and it was almost as though the scent were alive, like a little brown mouse, from cold nose to black beady eyes to rubbery tail. My mother, now 75, has sometimes reminded me that, in Midcentury, fine fragrance was a real luxury on a par with furs and diamonds for most people… by no means the sort of fun, thoughtless, everyday thing it has become for most Americans, the way we’ll frequently switch out our fragrances on a daily basis; no, in those days, a woman often chose ONE fragrance and stayed with it her entire life. Was it Joan Crawford who talked about going to the opera and being able to sniff the air and know exactly which socialite was seated in the auditorium around her? It was that kind of “preciousness” and “rarity” and specificity I picked up in that 1963 extrait, and I very much had the impression that it was expressly designed, with its “little furry animal” odor, to be worn WITH FURS. Now that modern political correctness has made fur-wearing taboo for so many, even the ultra-wealthy, SHALIMAR has had to take on another complexion, I daresay. I so enjoyed reading about your various Shalimar experiences and loves, Rasputin. And thank you for the kind words on the post. With regard to the 1963 version that you tried, I smiled at the “mouse” comparison and think you raise an excellent point about how the fragrance was intended to be worn with furs (and jewels). It very much has that sort of grandeur, but also soft, furry olfactory animalism. One thing that I’m curious about: you say the current EDP is basically your signature scent, but have you not been tempted to go for vintage formulations rather than modern ones, particularly given the impact of the vintage fragrance on you? I’m not not necessarily talking about wearing or going after the vintage parfum, particularly as it’s not the sort of thing that one can wear daily on any affordable basis, but perhaps the better priced EDTs that one can find in large sizes? Do you not find the olfactory and raw material differences present with the current EDP to be noteworthy? In all the years that I’ve been buying vintage fragrances on eBay — across various brands from Guerlain to YSL, Hermes, Rochas, and others — I’ve only had one fragrance that was “off.” It was a bottle of 1970s Opium, and it was limited solely to the citrus top notes during the first 15-20 minutes. After that, it smelt the way it was supposed to, but that was the sole instance of a vintage bottle not being the exact way that it was supposed to. Was it the way its owner had kept it or something else, I have no idea. Citrus top notes can evaporate or, in some instances, turn wonky over a long period of time — even if someone keeps their bottle perfectly. One commentator here talked about a gorgeous smelling bottle that she bought where the seller told her it had been kept in the bathroom, but she was happy to discover its aroma was unimpacted by any heat or light factors. She thought it smelt fantastic and just as it should be. My ex’s grandmother had a never opened bottle of Shalimar, in the Marly bottle, recieved from a former lover in the early 60s. The lover’s mother had owned it for a few years prior so the bottle dates from the late 50s. I did everything. Everything. To get my grubby hands on that bottle. She wouldn’t give it up, memories attached to this former lover (that she denied had been a lover but family lore went otherwise). Finally, in exasperation one evening I grumbled and asked why she had never opened and used it if was so damn precious? I refrained from saying that she didn’t have many years left and what was she waiting for. She said, simply, that upon receiving the bottle she had gone to a store and sniffed a tester. She really doesn’t like heavy perfumes and it’s not her style, but the bottle holds memories and is a nice decorative piece in the bathroom. I was going to die which would have been more merciful than imagining throttling a defenseless little old lady. As my relationship with her grandson came to a quick end, the last time I was over I seriously considered pilfering the bottle. The grandparents had been through health issues and wouldn’t have noticed the loss. I stood for a full 15 mins in the bathroom. Alternating between looking at the bottle, and then at myself in the mirror wondering what kind of person would consider doing this. I didn’t take the bottle. I still don’t know if that was a good enough decision on my part. “I stood for a full 15 mins in the bathroom. Alternating between looking at the bottle, and then at myself in the mirror wondering what kind of person would consider doing this.” — I laughed for a good minute or two, OUT LOUD, at this. When combined with your reaction at hearing the bottle being used as bathroom decor when she didn’t even like the fragrance, I laughed out loud so much and so often at your tale that I woke up The Hairy German. My dear, you did the right thing in leaving it because she probably would have noticed the loss of something so meaningful to her (memory wise) but, oh, how I understand your feelings. I know we’ve talked about L’Heure Bleue in the past, albeit briefly, but I love it as much as you do. It’s always vied with Shalimar as my favourite Guerlain, and occasionally edges it out. I actually thought of you when I got an old bottle recently. I’ll get around to reviewing vintage L’Heure Bleue one of these days since there are SOOOOO many new releases that I’m quite behind at this point, but one day I want to hear your L’Heure Bleue stories. As for Shalimar, have you had any luck on eBay? Vintage Shalimar bottles seem to outnumber the L’Heure Bleue ones by a 10 to 1 margin from what I’ve seen. And let Zola nap, the man needs his rest 🙂 i hope hes doing well. First, welcome to the blog, Reddtx. Second, that husband of yours is a keeper. 😉 🙂 Give him kudos from me for his thoughtfulness and taste. Have you never been tempted to open your bottle and wear it? I know what it’s like to want to keep unopened bottles pristine but, for me, the urge to open it would eventually outweigh it. Plus, life is too short, so I’m a firm believer in pampering oneself in such small ways. Regardless, whenever you do open your bottle, I hope you find its scent on your skin to be even more beautiful than when smelt from a sealed bottle. Thank you for the welcome. I’ve been a reader for a few years, but you definitely made me want to respond when you brought my beloved Shalimar into the blog. You really made me think about why I’ve left the bottle sealed. I cannot think of one good reason. As soon as the first cold snap hits here I will break it open. I also saw your reference to L’Heure Bleue. I absolutely adore this fragrance. It was my first Guerlain love and will always hold my heart I look forward to your review of it! And I forgot to say that yes, my hubby is a keeper. We’ve been married for 36 years and I can’t imagine life without him. I can’t decide which news is better, your decision to finally (finally!!) open that bottle of Marly Horse Shalimar extrait, your increased comfort level in posting here, or your love for L’Heure Bleue. I would say all three, but your comment about your husband and your wonderful, long marriage (knock on wood, knock on head) outweighs them all. I’m so happy for you. I don’t know you one bit, and I’m genuinely so, so happy for you. It’s so wonderful to hear about relationships and/or marriages like that, particularly in this day and age. In perfume related matters, I was really glad to hear that you love L’Heure Bleue so much. I think it was my first Guerlain love, too, but I tend to go back and forth on the matter, especially now that I’ve smelt the extra, extra old Shalimar extraits. One thing is certain, though, I feel surprisingly protective towards poor L’Heure Bleue, the “Jan Brady” and frequently overlooked, dismissed or forgotten sister in the Shalimar, Mitsouko, L’Heure Bleue trio. Far too often, when I read people’s comments on their favourite Guerlains, all the usual, very popular classical and modern ones are mentioned… except for L’Heure Bleue. I’ll try to do a review for vintage L’Heure Bleue as soon as I’m able, but it may not be for a while. I’ve fallen behind terribly in covering the new releases because the vintage posts always take three to four times as long due to bottle, dating, and historical research factors. In my ideal world, I could put aside the need to cover new or upcoming scents to do 4 or 5 vintage reviews in a row, things like 24 Faubourg, Femme, L’Heure Bleue, Jolie Madame, etc., but that would probably take me more than month given the time I spend on each of the vintage reviews. I’ll definitely have time to do a few in January 2017, though! Anyway, have a great weekend, Reddtx, and it’s been lovely chatting with you. I hope you’ll comment more often and give me the chance to get to know you and your perfume tastes a bit better. My mother had a bottle of the 1970s Shalimar. I can still remember going into her bedroom and taking the bottle off her dresser, carefully removing the stopper and taking a long, glorious sniff. I never applied it because it was too heavy for child and teen me (also, mom would definitely notice that I had borrowed some!) but I loved that beautiful, sophisticated scent, which made me think of an elegant woman in a velvet Madame X dress wearing diamond stars in her hair and a black fox fur coat with the lush shawl collar turned up to frame her face. It might not be as good as the earlier Shalimar, but compared to the more recent reformulations it’s magnificent. I bought a bottle of Shalimar a few years ago and ended up returning it because it didn’t smell like my memory. I later found out (from you, I believe) that its formula had been redone- to its ruin. Sargant’s Madame X is a great mental imagery and association for vintage Shalimar, Aurora. I love it. I remember well your reaction to the modern Shalimar that you bought. You veered between utter bewilderment and horror. LOL. Have you considered trying for a vintage version? I think something like the EDT would suit you and your personal style, not being too heavy so it wouldn’t wear you instead of you wearing it. I cannot thank you enough for this fantastic post! It makes me long for my 1960’s bottle that somehow went missing during my move several decades ago. I replaced that bottle time and time again with other vintages. Now the only one I have is one that I purchased a year and a half ago. You’re very welcome, Filomena. I’m sorry to hear about that missing 1960s bottle. It must have been so frustrating, and of all things to go missing, too! A 1960s one! I hope its vintage replacement is almost (almost) as lovely to you, though. Thank you for your interesting and informative post. I shall await Part II with bated breath. A few years ago, I smelled Shalimar at a department store counter and was completely turned off. I wondered what all the fuss was about. I never went beyond that and resolved that Shalimar just wasn’t for me. After reading your post, i am determined to give it another try, especially if you can say that it surpasses vintage Opium which is my Holy Grail of fragrances. I shall try to find a small amount before I invest in anything larger. Forgive my ignorance, but you refer to Marly Horse bottles. Could you clarify what is meant by that as opposed to Baccarat bottles? Thank you again. By the way, I finished Season 6 of Un Village Francais. Merci beaucoup. IMO, the modern Shalimar is not just a pale shadow of what it used to be, but a truly unappealing scent. Particularly so in the lower concentrations. Overly, overly synthetic with dirt cheap high-pitched “bergamot,” inexpensive materials, and very little roundedness or depth. It’s NOT a good basis on which to judge the composition, alas. The vintage parfum is the way to go, especially for someone with tastes like yours and an appreciation for rich, dark, or heavy fragrances (like vintage Opium was). I know there are some eBay sellers who offer samples of the vintage parfums, so that’s one option for you. 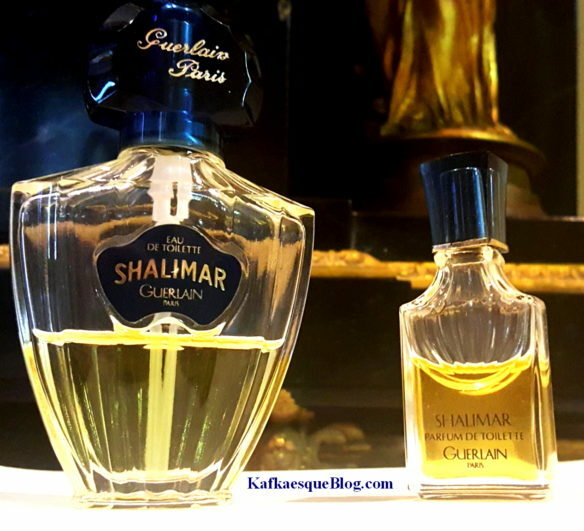 Whatever format or size you opt for, though, *VINTAGE* Shalimar is definitely worth trying at least once in one’s life, especially if one can try the older versions in parfum strength. Modern Shalimar is… hmph. The article was so interesting, being a 50 year user of the elegant perfume I will forever use it. Be still my heart! Something surpassed your beloved Opium??? This is a wonderful, comprehensive post and should be required reading for all except the sellers of vintage Shalimar. I, too, can’t wait for Part 2 as I would like to date a 10 mL pure parfum in a Marly Horse bottle (never knew there was such a designation!) I have which the seller claimed was from the 60s/70s. The juice is quite dark. “uuuh oooh” would have been my reaction, too, Marion! I’m so glad, though, that your bottle was unaffected! We have to think of some way around this, Yinghao. We really must. Are you active on any perfume groups? Perhaps someone can sell you a sample just to try? If you’re located in Paris, I believe Guerlain offers one day workshops that give one the opportunity to smell their vault of vintages in 50-year form, so perhaps that is an option? Ah indeed, I haven’t thought about trading within the community. And the Guerlain workshop sounds very interesting! I didn’t know that they offer such an opportunity. Kafka thank you for this brilliant post!! This is the perfume I’ve been wearing the past few months (after searching high and low for a new fragrance for two years) and it is beyond incredible. When I was experimenting with finding a new perfume to wear the current version just didn’t have an impact – the opening was beautiful but, it would dissipate within ten minutes when it turned into pledge. I then started sampling some of the vintage and I have two bottles and they smell different – one better than the other. Your beautiful article explains why and I am so grateful. I just LOOOVE it and want to wear it forever! Awww, I’m so glad the post proved to be helpful and useful. I laughed at how you described the modern Shalimar as “pledge” — that may be too generous a description. 😉 😛 The ones I smelt back in 2010 were so much worse. Pledge would be a more rounded, warmer, deeper smell in comparison. They were so godawful that they actually put me off Shalimar for a while. I’m glad you discovered the vintages and the real beauty of Shalimar. Congratulations on your two bottles. I know you smell fantastic when you wear either one. Thank you for this. It’s Thanksgiving here in Canada, and its raining up a storm! So we have to light the candles, and let them burn all day, wear cozy slippers, and read, watch tv, eat leftovers…and talk of Shalimar! Thank you for the comprehensive review. Shalimar has such a history. The way you describe your mom’s bottle is mind blowing. I read Rita Hayworth wore this scent-can you imagine her, at the height of her beauty, wearing this? I have so many vintages of Shalimar-none as old as yours, but all of which give me a lot of pleasure. One new years eve I ran into a friend of mine, who told me to come to their perfume shop. The shop always sold testers of things they could not get for their customers anymore. I was having a pretty dreary year, and my friend knew that. So guess what she had for me? Shalimar perfume, eau de parfum, eau de cologne and eau de toilette. Vetiver. Habit Rouge. AA Winter Delice. AA Pamplelune. Apres L’ondee perfume. Charade EDP and EDT. Each bottle was perfect, and cost $20. The proceeds went to charity. Perfume people are the best-just the kindest people on earth. I didn’t buy everything they had because I wanted to leave something special for someone else who was having a not so great year. So for me Shalimar is the best scent on earth because it has such a storied history, and because I associate it with kindness. One bottle dates from 2000, and I think it’s the Jade Jagger designed bottle. The strength and complexity of the scent amazes me. I think it’s the first time I smelt what I was supposed to-all the bergamot, roses, labnum. It stays on my skin for hours and does not overwhelm. I have never experienced anything like it. I wore it a lot and thought of all the beautiful people who had worn it over time, and it sort of…gave me a bit of strength and confidence when I needed it most. I know this sounds over the top-sorry about that-but Shalimar always elicits that response in me. The older EDC and EDT are also good to have on hand, for the reasons you state in your glorious article. Not hard to find, often really affordable, always in a beautiful bottle. An affordable treat with consistent quality. Nothing wrong with that , at all! And slightly off topic-I received 4 mms of Jicky perfume last friday. Wow. The lemon and lavender and civet blow me away. There is an instant where the civet rules, and that is an odd thing to my nose. Then it becomes almost the best thing I have ever experienced. Amazing. What a thoughtful, loving, considerate friend, Carole! Her gesture was very touching, but so was yours to leave something behind for others to try at an affordable price. It was just as considerate, my dear. And, no, your response to vintage Shalimar doesn’t sound at all “over the top” to me. I think it’s wonderful. BTW, I hope you had a happy Thanksgiving and that it’s not too cold in Canada. Your Thanksgiving evening sounds delightfully cozy. I cannot remember the real scent; however, ever since, Shalimar has had this mythical olfactory sensation to my mind. Thanks for the warm welcome and for your kind words! Actually, after reading the post, I bought an umbrella flacon on eBay Germany with the code beginning with PA 0151 BL which—if I read “Raiders of the Lost Scent” correctly—should or at least could be from 1976. No Marly Horse, yet 40 years old isn’t too bad, I thought. Once again thank you, and let me assure you that I read nearly all of your posts and admire your detailed reviews and unapologizing critiques. Hello my dear, I am still here….happened to see your post on Shalimar and could not resist a quick comment. I still have my mom’s 1954 box and empty bottle of Shalimar that was gifted to her by a perfumista aunt who bought all the best there was to offer in the 40’s and 50’s when my mom was a tot to and adolescent….I can still smell that intoxicating aroma even though the bottle is safely stored away at my dad’s house. It’s nice to see you again, Don, and I hope you’ve been well. I bet your mother’s 1954 bottle was a beauty! Shalimar virgin here ! Reading some of your recent posts, I was thinking about how i wanted to try a vintage Shalimar. I feel like it’s a treasure I have NO idea about, frustratingly. So your posts are just what I needed! I second the poster who mentioned your first-class nose and writing. Eagerly waiting for part II! Thank you, my dear, I hope to be able to help you navigate the complexities and to help you get your first bottle or sniff of vintage Shalimar. It’s definitely one of those things that every serious perfumista should try once in their life. Now that you’re in the US for a short while, it will be easier for you to find than if you were back home where French eBay has a ban on the selling of Guerlain fragrances. Just one word; salivating! And a thought; you smell absolutely fabulous!! Enjoy that mega find dear Kafka! It seems like only Shalimar has the power to entice this lurker out of the shadows – the last time I commented was when you reviewed the Mexique flanker. This post made my heart beat faster. I have to admit I’ve reread it a couple of times for the sheer happiness it gives me, much like Monsieur Guerlain’s post on trying the recreated originial formula Shalimar. I’m too shy to comment all that often, but I do follow your blog religiously. The long, detailed reviews are always so interesting to read, even when I don’t think I’d enjoy the perfumes. I loved the amber posts (particularly the ambergris bit, haha). As someone who is bizarrely sensitive to some aromachemicals, I always read your reviews before I sample things. I have to admit I blind bought the 5 ml travel size of Moon Bloom back when it was discounted based on your review. I used it up in a month, which is unheard of for this serial undersprayer. What a beauty! 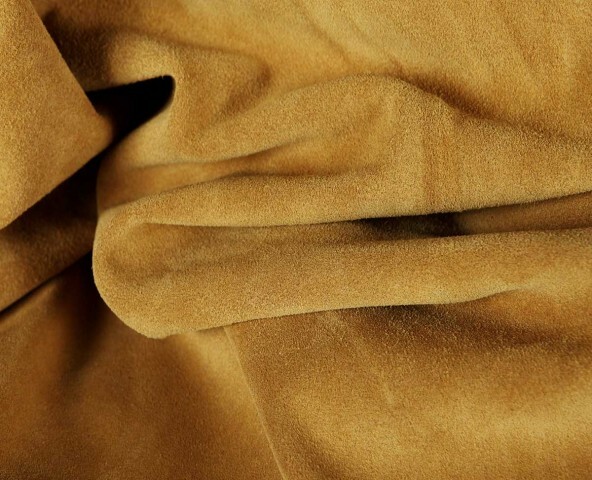 And Shangri-La might still convert me to chypres – I get this soft, cuddly suede-y iris in the basenotes. I also enjoyed my sample of Salome, although, like the other Papillon perfumes, there’s a woody amber or something in there that ultimately ruins the scent for me (it’s like the scent equivalent of audio feedback in a loudspeaker, a screech that drowns out the rest of the notes and outlives them). I’m starting to think there’s something wrong with my nose, as no one else seems to smell what I’m smelling. It’s definitely not a skin chemistry thing, as it’s even more obvious to me when I smell the perfumes on test strips. Well, this turned out long and rambling. Anyway, I’m really looking forward to part two! Anyone who uses “postlapsarian” in a comment on perfume needs to come out of lurkerdom and hiding, Linnet!! Please, I mean it. There is no reason to be shy. None of us are professional noses, and one doesn’t need to be an expert to share one’s passion or love for a fragrance. I enjoyed reading your thoughts on the various Papillon or Hiram Green fragrances very much, so don’t lurk and come out to play with everyone else. 🙂 Perfume is one of those things that seems to become extra special when one’s love is shared with others. Thank you for magnificent write-up of the one of grandes dames of perfumery. Who could resist a dab of vintage extrait after reading it? Certainly not me. First, welcome to the blog, Sam in London. Second, thank you for the clarification. The PdT version always confuses me, particularly as I thought I remembered reading somewhere (with regard to Jicky) that it was an intermediate concentration, but either I was mistaken, recall things incorrectly, or the site was mistaken. Either way, accuracy is best, and I really appreciate your clarification. I’ve updated the post with a correction to reflect your information. I’m so glad, and I hope you find the perfect bottle! PLEASE HELP!! I collect many vintage perfumes. I love your blog and found it so helpful but sadly, I remain stuck trying to find information on this one specific bottle of Shalimar. If anyone can please help me I would so appreciate it. It is an umbrella type bottle with a gold top with a black spray pump with beautiful scrolling on the top. Unfortunately the sticker on the bottom is missing, so I have no other information other then the bottle! I don’t know how or if I can post a picture but you’re welcome to contact me at my email address, and I’m happy to send one if you don’t mind helping me. Thank you so much In asvance for your kindness. If someone out there can help, you’re welcome to release my email address to them. Thanks again!! Hi, welcome to the blog, Debi. I’m happy to help if I can, but I’m really not a dating expert like some others, especially for the Parapluie/Umbrella design. To the extent that I can assess the age of vintage Shalimar, it’s mostly for the bat/urn bottles. The Parapluie/Umbrella is tough, particularly as there weren’t noticeable variations in its shape and the base is so small that markings are hard to assess. But the fact that your bottle has a black spray pump is quite unusual. The only aerosol spray bottles that I’ve seen for Shalimar parfum were from the 1980s and never for an Umbrella bottle. So, I’m not sure I can really be of much assistance, but if you want to email me the photo, then feel free. 🙂 What I really suggest would be for you to write to the people at Raiders of the Lost Scent since they specialize in the look and dates of fragrance packaging. You are so sweet to get back to me. Thanks so much. I will take your advice for sure on Raiders. I hope what I said makes sense-the top is the gold I’ve seen before-but the push button on the top to spray it is black with lovely markings on it-but the whole top isn’t black. Can’t find anywhere and no label or box! May I email it to the return address on your message? I do everything on my iphone-so I don’t know how to post it here? If it’s too much trouble, I totally understand. Thanks so much for your time!! No, sorry, I have not. The 50 oz one interests me. That’s 1,500 mls and must be a foot high, possibly even taller. You say it’s not a factice or display bottle, but filled with a actual perfume inside? Wow. Where did you obtain it, if I may ask? As I said in the review, bottles, their design, and dating them isn’t really my area of expertise. I specialise in scent analysis. 🙂 My suggestion would be to look at the Guerlain Perfumes blogspot article on bottle designs for information on the more unusual bottles. Hope you find what you’re looking for. Happy holidays. Thank you for the post. So interesting. Oh, my. I gave up on Shalimar in the 90’s because it just didn’t smell like what I had been accustomed to. Two particular bottles that I had in 1980 stand out to me. One was an ounce or so, and my cat used to regularly go into the room, jump up beside it on the dressing table, and PuRR really loudly. The other one was absolutely huge (about 4″ tall), and was purchased for me in the Virgin Islands by my then new husband. They were both in beautiful bottles in the purplish velvet cases. (In fact, for a long time, the bottles that he gave me were in those boxes.) The scent lasted forever when worn, and made me as well as the cat feel transported. I think perhaps the Shalimar I had in the early 80’s might have been from the 70’s. Then they changed it. Then again, and I have missed it so much. I was on a site that sold Shalimar, one in “original packaging” (I assume older, but probably not vintage), which was more expensive than the newer, same sized one. Then I got sidetracked by you! It’s nice to know what smells are from what era, and also to know that it can be purchased (if found) without having to worry about its being “off”. Your expertise is amazing, and I thank you for all the time and effort put into your posts. I have a hugh bottle my mother left me possibly from the 50’s/60 measuring 11 1/2 in. high.